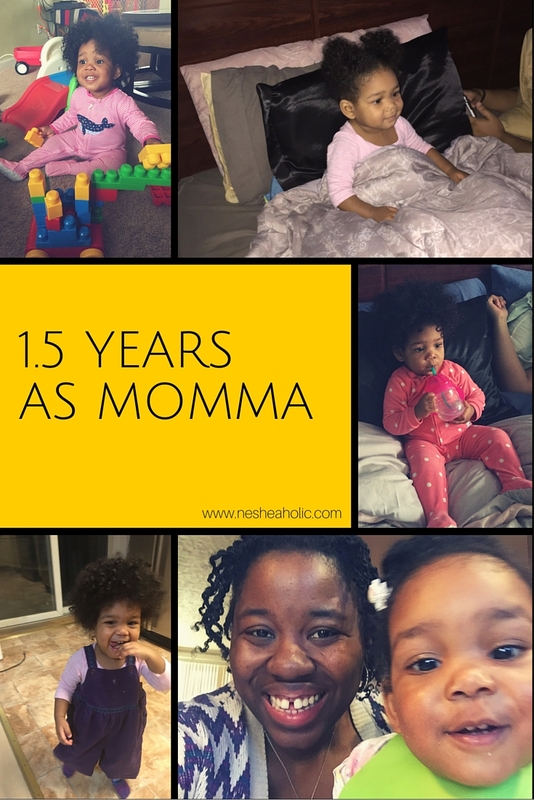 When I realized the other day that BabyCakes was 18 months old, and that 18 months was a year and a half I was taken aback. Somehow it doesn't seem like she's been with us that long, while simultaneously feeling like we've had her all along. Her current vocabulary: milk, up, elbow, more, night night time, cheese, hot, thank you, uh oh, momma, and Caillou. She'll also repeat most words. She can point to her nose and ears when prompted. She loves being tickled. She sings along to songs (the introductions to Bernstein Bears and Caillou in particular). She also claps to songs. She shakes her head and says "no." She throws a mean tantrum. She likes to put her dolls in the highchair and feed them. When she gets excited she bounces and spins around in a circle. She eats like a champ and has started to be able to spoon feed herself (I still have to load the spoon for her). She'll eat any protein or potato. Her favorite vegetable is collard greens. Her favorite toys are her little slide, a little toy oven and a toy seat set, and her Chica toy. She's not a cuddly kid at all, but she gives us occasional hugs and kisses, which we life for. She can draw (with some help from momma). Her hair is so long at this point that I have to do it regularly. Leaving it in her 'fro makes it tangled and it's always in her face. Her smile and laugh make everything right with the world. Every day with her is so special. Really nice blog! I followed you on IG & Bloglovin- I need new blogs to read. my daughter just turned 3 so I know the feeling ..
and the time goes by SO fast. Enjoy every moment- before you know it you'll blink and she will be 3! Thanks! I followed you back on Instagram. Looking forward to connecting more.